For last year’s Hackaday Prize, [PK] tried to build a video card for microcontrollers and headless Linux systems. It was only 640×480 resolution VGA, but the entire project was designed around a CPLD communicating with a microcontroller over SPI. This prize entry was, by [PK]’s own admission, a failure. It was late, but now he’s had an entire year to perfect his design. That means he can enter version two of his VGATonic in The Hackaday Prize. The VGATonic version 2 uses a Xilinx XC95144XL CPLD for the VGA timing, and an ATTiny 2313a to read the SPI bus. Video memory is four megabits of static RAM. That’ls pretty much all you need for the most basic VGA graphics card, and all of this is packed onto a 3×3 inch PCB. You can do a lot with 640×480 8-bit graphics running at 25FPS. In the video below, [PK] has a ‘hello world’ of sorts, Doom, running on a Raspberry Pi 2 with his SPI graphics card. Yes, it’s a graphics card for the Raspberry Pi, and it looks really good. Further refinements of the design will include some primitive graphics routines. Not OpenGL or anything fancy, just something to reduce the number of writes on the SPI bus. It’s a great project, and perfect if you want to add video out to an Intel Galileo or other microcontroller project. [PK] has a video demo, you can check that out below. If you’re not willing to shell out for a reasonably powerful laptop it seems that there’s not a ton that can be done to boost your gaming performance. That is, unless you have an empty Express card slot and the right chipset. [Phatboy69] recently put together an external video card for his notebook, with fantastic results. His Vaio Z128GG had an Nvidia GT330M graphics card onboard, which is decent but nothing to write home about. Using an Express card to PCIe adapter, he added an external Nvidia GTX580 to his system, and he couldn’t be more pleased with the results. While the card does take a performance hit when connected to his laptop in this way, he claims that his graphics performance has increased ten-fold, which isn’t too shabby. There are many variables on which this process is heavily dependent, but with the right amount of tweaking, some great laptop gaming performance can be had. That said, it really does take the portability factor of your notebook down to about zero. If this is something you might be interested in, be sure to check out this thread over at the Notebook Review Forums – it’s where [Phatboy69] found all the information he needed to get his system up and running properly. Have a penchant for pain? Why not destroy your fingertips with a wire-wrap tool building a video card made entirely out of discrete components. When [Chris] decided to build an entry for the Dangerous Prototypes 7400 logic competition he already had his hands full. The 74xx chips he had on hand had a maximum clock frequency of 25MHz, but the VGA pixel clock runs at 40MHz. dividing the H sync timing by 4 means the maximum speed required of the video card is only 10MHz, albeit with a reduced resolution. The video card was constructed on perfboard with wirewrap sockets. 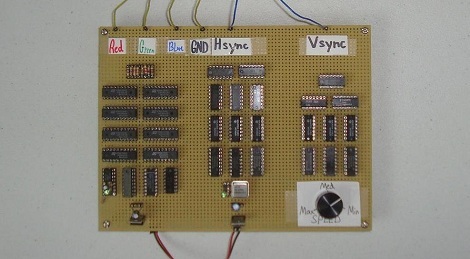 An 8-bit DAC was included, allowing the card to display 256 separate colors but only the three primary lines were wired up to the VGA cable. As is, the card cycles through 8 different colors in a constant loop, not bad for a pile of chips. VGA out has been done on everything from an ARM to an ATtiny, but rarely, if ever, has VGA been done with discrete components. While this video card may not be our first choice for bitcoin mining, it’s still a very impressive build. Check out the walk through video after the break. With most of us utilizing at least two monitors these days in our day to day operations, six monitors, while an awesome thought, might seem a little too excessive. After all, do we really have space for multiple video cards? AMD has a new setup in their testing lab that is running six Dell 30inch displays at 7680×3200 through a video card holding six DisplayPort connectors. 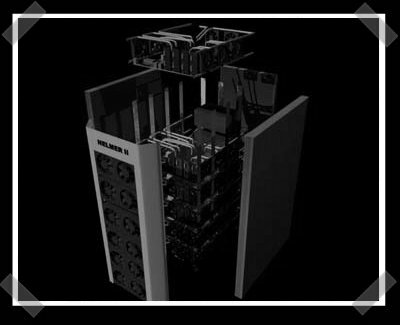 Maximum PC has the scoop on the setup, and they say that this single GPU will be coming out on AMD’s DirectX 11 capable chips. Details are slim with the amount of video RAM, speeds and cost not known at present. Think of the possibilities! Trade shows are one thing, but how about a video wall at home for gaming and movies? How would you use the six monitors shown above? Be sure to leave your ideas in the comments.